The "all or nothing" attitude taken by some vegans on the internet sometimes makes me a little sad. I find the idea that someone has to fully 100% commit to vegan eating on their first try, or face being branded an uncaring, dispassionate fool by the vegan community incredibly discouraging. I am of the opinion that even if somebody eats a full roast chicken every night for their entire lives, yet on one occasion decides to try a veggie burger, that this one-off decision should still be applauded. At the end of the day, every little helps. Making one vegetarian or vegan choice even amongst a sea of carnivorous ones is still positive both for the animals and for the environment, and I believe that this is something to be encouraged. I think that we should praise people for the meat-free attempts that they do make, rather than chastising them for eating meat at other times. 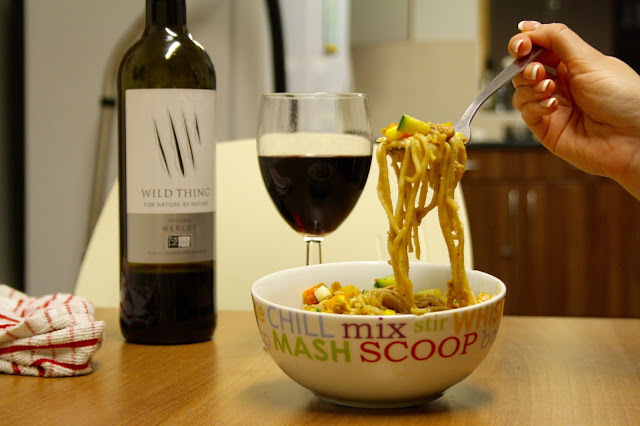 Today's post aims at showing you that if you do want to change just one thing in your existing lifestyle, whether it's just to try it out due to curiosity, or because you want to make an animal-friendly choice, there are plenty of tasty options out there. I'm not trying to force my vegan views down your throat, I just want to share some of the tasty things I've been trying this January. Let's get started! Sampling a vegan option doesn't mean that you have to radically change your current eating routine. 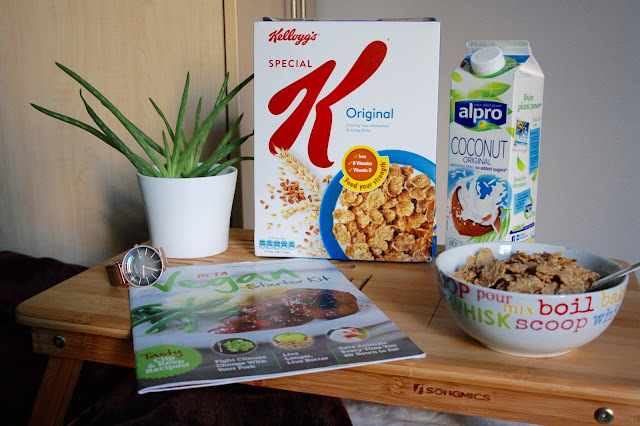 You can do something as simple as pairing such as your regular choice of cereal (Rice Krispies, Weetabix, Frosties, Kelloggs Fruit & Fiber, Shredded Wheat plus many more are vegan) with plant milk. It can take a while to find one that floats your boat. 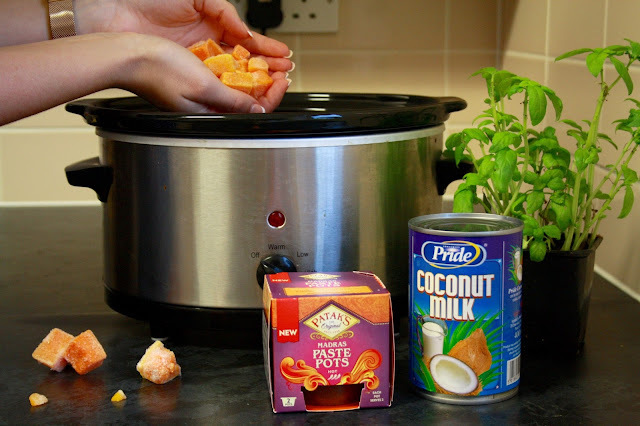 The coconut milk pictured here from Alpro has quite a strong coconutty taste and a thick texture, but the brand KOKO produces the same product without the powerful coconut tang. I have found Alpro soya milk to be a good option for someone dabbling in veganism, and usually I either opt for this or KOKO's coconut milk, whatever Tesco has that week! For lunch, you can't just beat a delicious sausage sarnie! 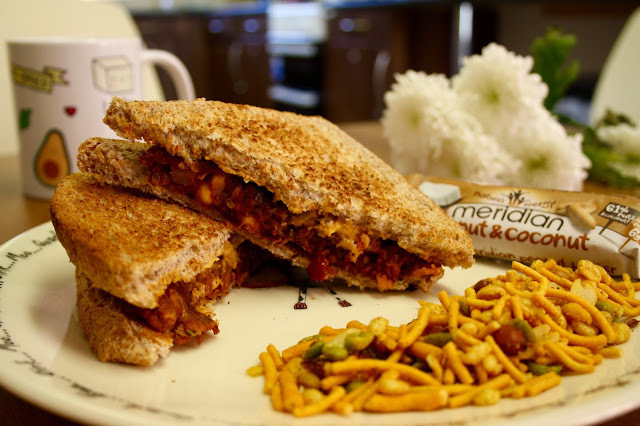 To create my ultimate sandwich, I cook up a batch of Cauldron's vegan-friendly sausages, which are made from grilled vegetables, haricot beans and tomato pesto. I season these with Baconlicious Smoky Maple Spritzit* spray-on seasoning, which provides the ideal mix of sweet and savoury tastes to lift your sandwich onto a level that's just divine! I serve my perfectly seasoned sausages in between two slices of toast with lashings of sundried tomato and basil houmous. To accompany my sarnie, I usually opt for some spicy Jalefrezi mix and a Meridian peanut and coconut cereal bar, as I love finishing off my lunch with something sweet. When I first tried Linda McCartney's fake duck pieces, I honestly could not believe that it wasn't real meat, AND that it was vegan friendly! Seriously, this stuff is delicious and I couldn't recommend it highly enough. Recently, I've been loving putting my fake duck into a stir fry. To make my stir fry, I pop some noodles on to boil, and at the same time throw a generous handful of the frozen "duck" pieces into a frying pan with some Baconlicious Ginger, Lime and Chilli* glaze. Once the frozen "duck" pieces have thawed, I add some chopped veggies such as peppers, spring onion, and courgette and fry until softened. Then I add the cooked noodles and some sweet chilli sauce - job's a good'un! A pack of minced beef can cost you around £3. A can of green lentils costs as little as 50p. Can you see why my wallet is a massive fan? And my taste buds are too! 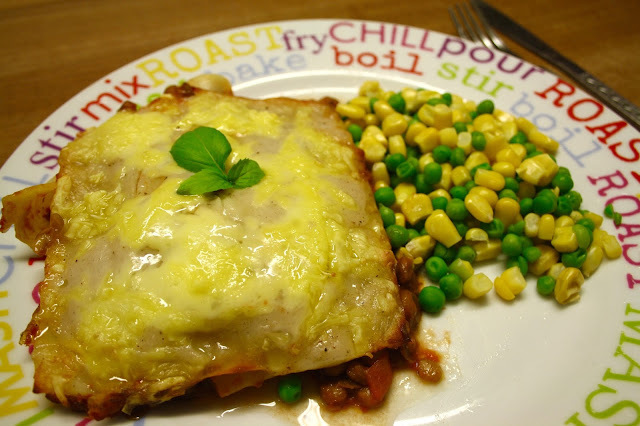 To whip up the perfect lasagne using lentils, I heat the lentils in a pan with a tin of chopped tomatoes and a little mixed herb seasoning. Whilst these are simmering away, I boil the lasagne pasta until al dente. I then layer up the lentil and tomato combo with lasagne sheets and a jar of vegan-friendly white sauce in a deep dish. I sometimes use thinly sliced aubergine or courgette instead of pasta if I want to make my lasagne extra healthy, roasting them gently for 10 minutes, seasoned with a little Baconlicious Zesty Lime and Tomato* glaze, before layering them into my lasagne. Once assembled, I grate VioLife vegan cheese on the top and pop in the oven at 180 degrees until cooked through. Delicious! A chicken madras is a dish favoured by many, but I guarantee that my vegan alternative will hit also the spot! I make my Madras simply by plonking 1 can of coconut milk, 1.5 teaspoons of madras curry paste, 225ml of vegetable stock, a couple of handfuls of frozen butternut squash cubes, a can of chickpeas, a teaspoon of mustard seeds, and a handful of dry red lentils into the slow cooker and heating on low for 8 hours. When cooked, I serve this with rice, peas, and my all-time favourite vegetable: roasted carrots. Recently I have been loving cooking my carrots drenched in Baconlicious Maple* glaze, which gives a lively and satisfying aromatic flavour. Thanks to the rising number of people adopting a plant-based lifestyle, many restaurants and eateries have started offering vegan options and others have full vegan menus! Wagamamas and Zizzis (two of my absolute favourite chain restaurants) are just two of them. 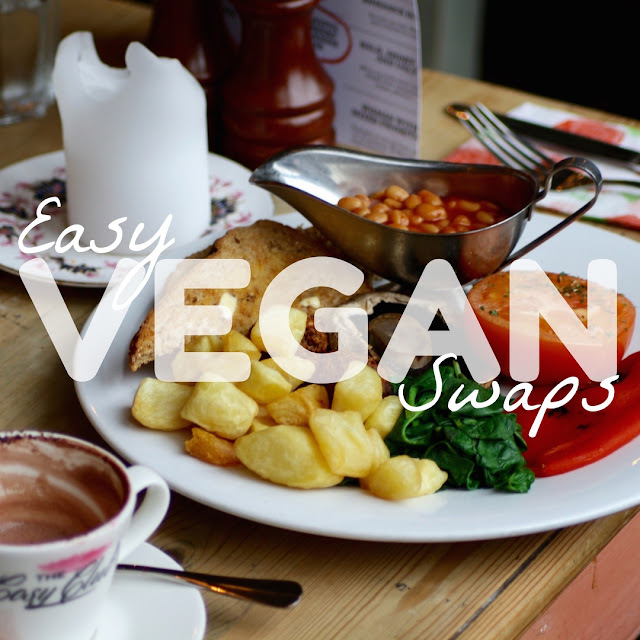 Giving a dish from a vegan menu a try while you're out and about is a great way of sampling a vegan cuisine, and you'll often find some real hidden delights! 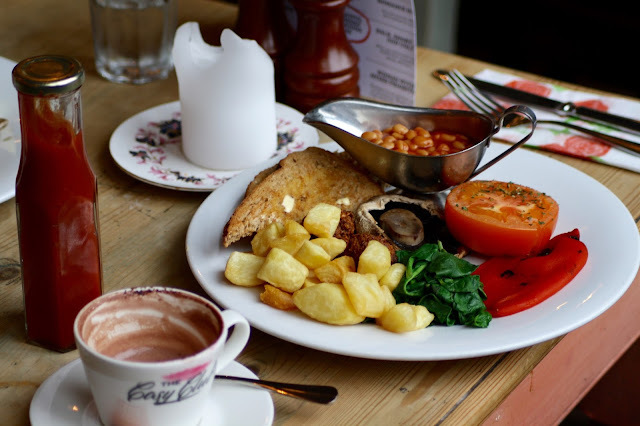 When out for brunch with my gorgeous friend Hels at The Cosy Club in Leicester, I treated myself to a soy milk hot chocolate, followed by a divine vegan fry up, complete with spinach, smoked peper, falafels, and chipped potatoes. It was utterly delicious and I will definitely be ordering it again in future! There are probably quite a few food items already sitting in your cupboard that you don't realise are in fact vegan. Oreos, Fox's Party Rings, and most brands of Bourbons, for example, are 100% vegan, as are many Walker's Crisps flavours. 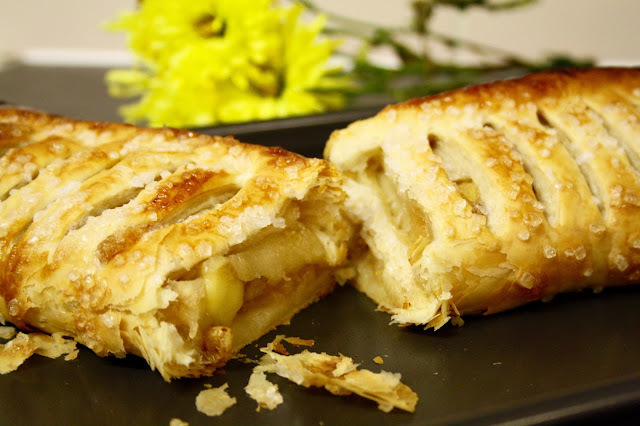 I also recently discovered that Morrisons own brand Apple Strudel (pictured here) was vegan and you bet I was off like a shot to purchase one when I found out. Check out Veganuary's official accidentally vegan product list and I guarantee that many of your favourites will feature! Let me know what your favourite meals are in the comments below, whether they're vegan or not! Please say hello to my wonderful January advertisers!